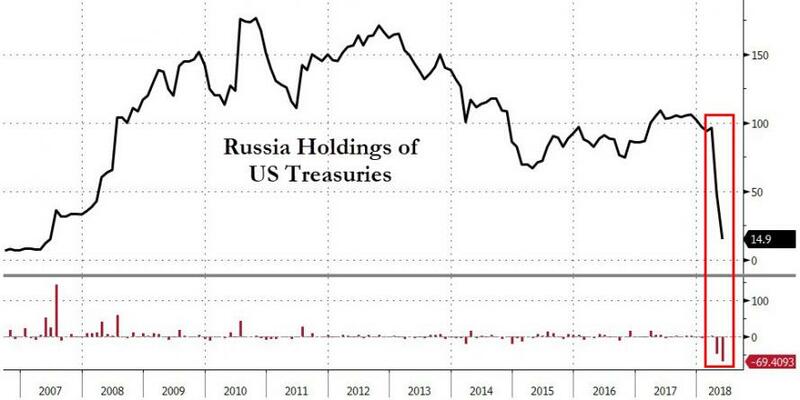 As we detailed here first, during the months of April and May, as the Yuan-denominated oil futures were launched, trade war threats escalated, and sanctions were unleashed, Russia liquidated almost 90% of its US Treasury holdings. The question most had was simple - why? 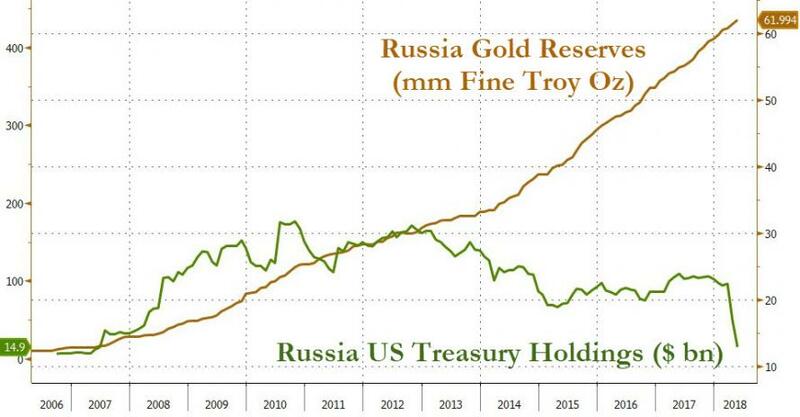 Speculation ran the gamut from this action being a dress-rehearsal - carefully coordinated with Beijing to field test what would happen if/when China also starts to liquidate its own Treasury holdings; to forced sales to cover liquidity needs on sanctioned Russian entities. 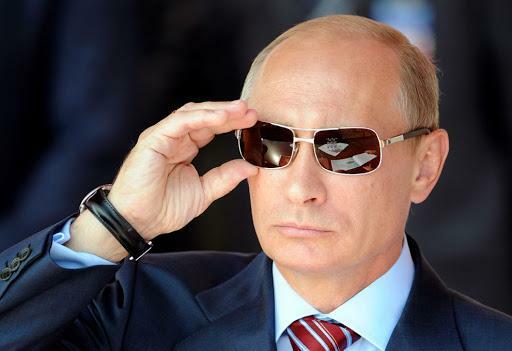 But now we have an "insider's" view on why Putin was puking his T-Bonds. ... because today the US represents the largest threat... from the point of view of imposing sanctions of any kind is greater than all others." 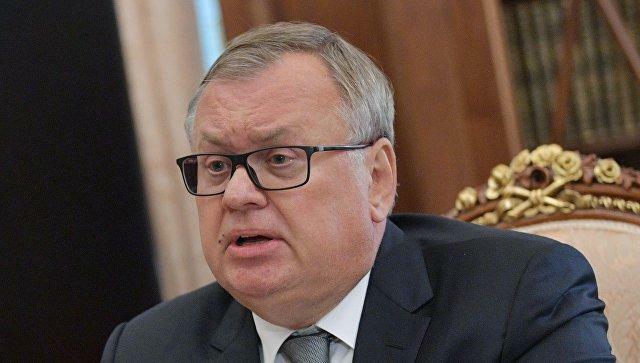 "I think that this, too, probably the Central Bank and the Ministry of Finance take into account in its policy,"
The head of VTB also recalled that the bank had prepared proposals aimed at de-dollarization and de-orphanization of the Russian economy. "I recently met with the president, I told him the proposals of our bank to reduce the dollar in the calculations, in general, in the economy of our country." This is a measure that, in my opinion, has two sides: on the one hand, it is good for developing its own market: if we will create our derivatives and we will hedge the risks on the whole instrument within the Russian market, it will be very good, as well as calculations. "On the other hand, life makes us," Kostin said. Additionally, Elvira Nabiullina, head of the Bank of Russia, said in June, responding to a question from Duma deputies about the sale of almost half of the US debt by the regulator in April, explained that the Central Bank is pursuing a policy of diversifying international reserves and taking into account all risks, including financial, economic and geopolitical decisions. Preparation for a global reset - due to "the feeling of impending trouble in the world economy." Do those sound like the kind of events that you should be acting on too? Is it any wonder that Putin is public enemy no.1 given the possibility that these risks may translate into actions by the worlds' investors? "We will continue to use the US dollar unless the United States prevents us from doing so." And given the volume of noise coming from Washington's establishment, that could be sooner than many - aside from the Russians themselves - may be thinking.